The house, which has been restored to a very high level, is set over two floors and benefits from double glazed windows and doors, with mosquito nets. The main entrance to the house is to the side. We enter into a hallway which, to the right, has a door leading to the kitchen. Also in this hallway, there is a staircase that leads up to the first floor. The main bedroom can be accessed from a hall way, and it is a very good size double bedroom. There is a good size family bathroom on this floor which is fully tiled. The bathroom has a bath, toilet, bidet, a hidromassage shower and vanity basin with storage cupboard beneath. The kitchen is located at the rear of the house and has good views over the countryside, and to the swimming pool. The kitchen is spacious and has partially tiled walls. There is a good range of built in base and eye level wooden units with granite work surfaces. Off the kitchen there is a sitting room with a freestanding wood burning stove. On the first floor there is a sitting area, two bedrooms and a bathroom, there is also access to storage in the eaves. The bathroom is fully tiled and has a bath with shower above, toilet, bidet and vanity basin. To the back of the house there is an outside covered terrace that can be accessed from the dining room. This terrace is spacious, and overlooks the swimming pool area and the countryside, there are table and chairs, and this part of the property is used as an outside dinning space. There are steps from the terrace to the swimming pool area, where there is one third bathroom with a toilet, sink and a shower. Next to this bathroom, there is a utility room, a storage room, there is also access to the garage. There are two garages, one is open the other one has concertina doors. Both garages are big enough for parking and storage. On top of the garage there is a big terrace with fantastic views. The property is connected to both mains water and electricity but also benefits from a borehole for irrigation purposes. There is a large water storage tank at the front of the house for this purpose. The property is set on a plot measuring 1.580 square meters, which has an abundant amount of mature fruit and olive trees in situ. The property is all fenced. The property is set on a quiet road which only receives a small amount of local traffic. There are neighboring properties in the vicinity though none too close to impede privacy within the garden. 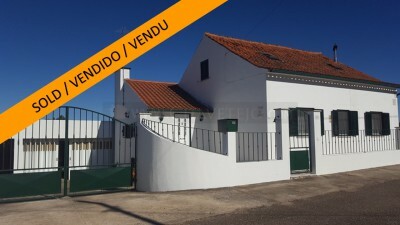 The property is situated in the small village of Martinchel, where there are cafés, mini-market, restaurant, hairdresser, and is around 15 minute drive from Abrantes, and 20 minutes from the historic town of Tomar. Castelo do Bode lake, Portugal’s second largest reservoir, is only 5 minutes drive. Castelo do Bode lake is popular for all kinds of water sport activities including swimming, sailing, canoeing, scuba diving and water skiing. The lake is also a haven for wild life and there are many river beaches close to the property where you can relax and enjoy the scenery. Abrantes has a good variety of supermarkets, shops, cafes, restaurants, banks, schools, hospital, bus and train stations, cinema, historic monuments and parks.